The Recovery Workforce Summit: 2015 Annual Conference offers a comprehensive line up of in-depth psychiatric rehabilitation training and enhanced networking opportunities and special events to provide attendees with the tools they need to help others more effectively. The Summit provides high-level education sessions for the entire psychiatric rehabilitation workforce; including agency executives, educators and researchers, practitioners and peer support providers with a specific focus on best practices, evidence-based practice, integrated healthcare, wellness, supported housing, and supported employment. Hear from compelling and inspiring keynotes. 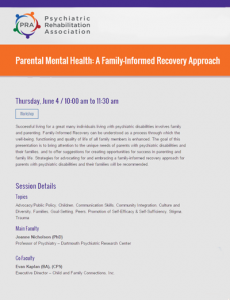 Select from an assortment of sessions for psych rehab professionals and hear what they’re doing at their organizations to improve the lives of people with mental illness.